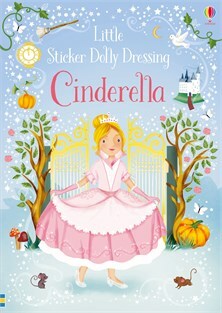 A delightful retelling of the story of Cinderella, with stickers to dress Cinderella in her tatty work clothes, and then in gorgeous outfits to go to the ball and meet the prince. With over 200 reusable stickers of clothes, decorations and accessories, plus a fold-out back cover to ‘park’ stickers whilst they’re not in use. These fresh, bright and colourful Little Sticker Dolly Dressing books... have beautiful and very practical glossy pages and each includes hundreds of hardwearing, reusable stickers.